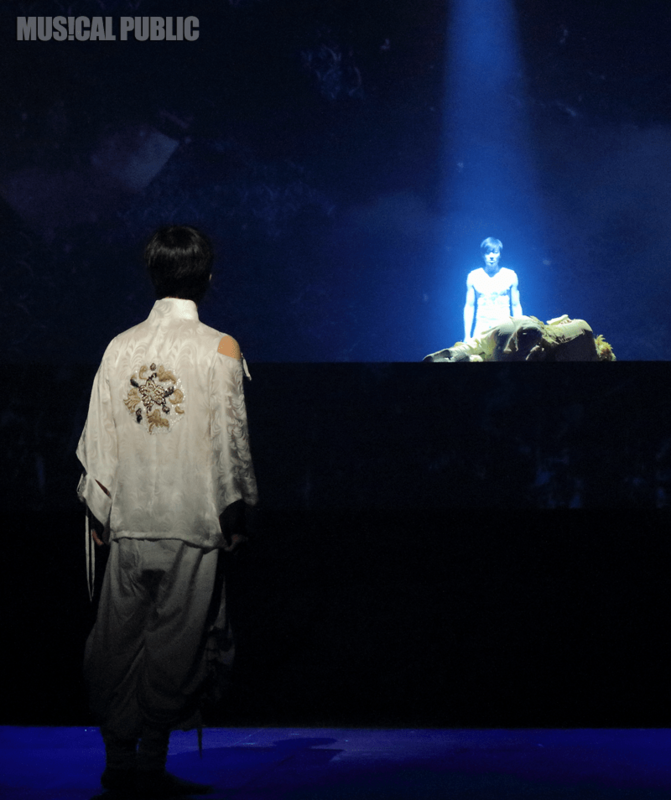 It is hard to imagine that in previous productions of the musical 바람의나라 [The Kingdom of the Winds] that the part of Prince Ho Dong’s spirit animal, the Phoenix 병아 리 [Byungari – baby chicken, or chick] was played by a male actor. Inasmuch as I believe Byungari was really neither male nor female specifically, I could not imagine any one better opposite G.O in the part than Kim Hye Won. Hence, I will refer to the Phoenix as a she. 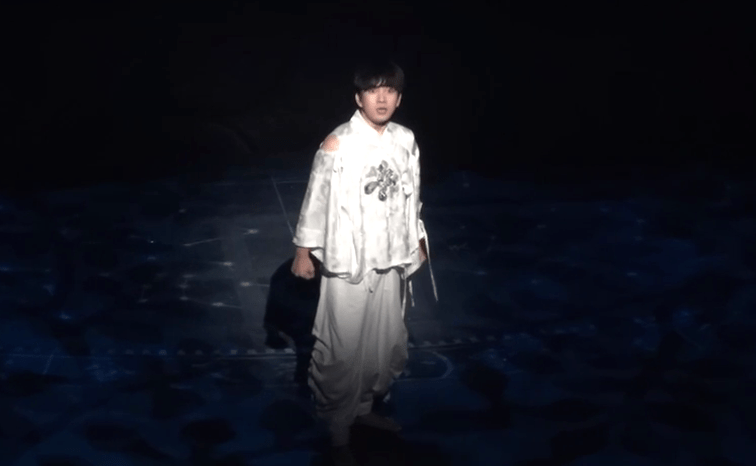 To say that I loved Ho Dong and Byungari in this musical (in this story), is an understatement. That the role of the Phoenix was portrayed by a woman made the interplay between Ho Dong and Byungari that much sweeter. What I could definitely gleen from the story while watching it was that since Ho Dong was essentially a five year old child, his spirit animal was also very young. Ho Dong and Byungari played like children. They argued like children. They loved each other innocently like children. Yet because Byungari was a mythical being (a Phoenix), she was instilled with a wisdom and experience not yet fully developed in the delicate and gentle Ho Dong. This is what made her so very important. Spirit animals, according to certain tribal or traditional peoples are often revered as guardians. Because he was a child, Ho Dong did not fully understand the importance of Byungari being there, always by his side. Everyone else in the kingdom knew well that she was perhaps his only ally and his true protector. It was critical to have such a learned and wise being protecting the young prince as he earnestly navigated through Muhyul’s vicarious and unstable kingdom. Initially, Ho Dong trusted Byungari’s counsel. She was his inner most conscious who patiently allowed him to develop. That is, until he began to exercise his will, or what he thought was his will: to follow in his father’s footsteps as a ruthless warrior bent on expanding his kingdom. Byungari knew Ho Dong’s heart better than he knew it himself. But as any petulant child would do, he attempted to stand his stubborn ground. She tried to reason. She tried to explain. She tried to remind him of his own heart. What Ho Dong did not realize was that Byungari’s pain would be his pain as well. When she felt the pierce of Muhyul’s arrow, so did Ho Dong. Although they were separate beings, their spirits were connected. 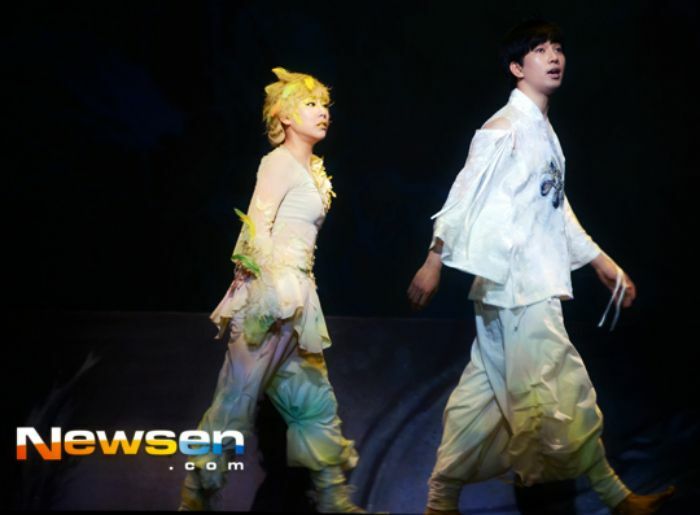 Thankfully there is fan cam out there that captured some of these amazing moments of G.O and Kim Hye Won on the stage. 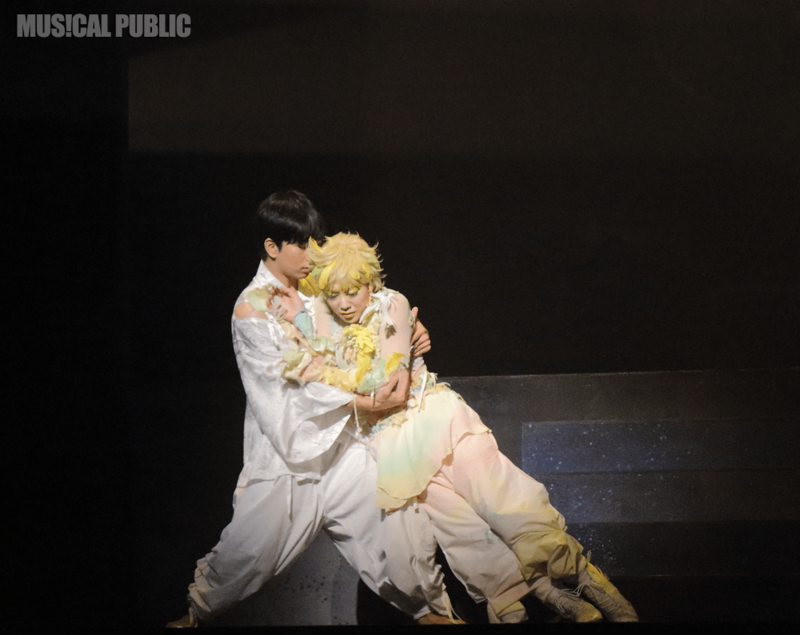 The playful light moments were my favorite and I must point out that those were among the only scenes in the entire musical that were filled with some semblance of levity and happiness. However, when Ho Dong begins to exercise his will, his desire (or so he thought) to succeed his father, to be a warrior king like his father, Byungari implores him to listen to his true heart. She knows his heart, she knows he believes in a peaceful kingdom, a kingdom without the smell of blood in the air. Ultimately, Ho Dong does the unthinkable when he angrily tells Byungari that should she attempt to stop him, he will kill her. For more context, the moment Ho Dong screams he will kill Byungari if she tries to stop him from following in his father’s footsteps, it is as if his words bring on the event and Muhyul kills Byungari. Ho Dong’s soft cry of “Byungari-yah…Byungari-yah” is so moving to me because he slowly begins to realize he has lost her and the voices around him are all basically saying, ‘what have you done, do you realize what you have done?’ It was so freaking tragic because the one being who protected him the most, believed in him the most, loved him the most, was gone. G.O embodied the innocence of Ho Dong wonderfully. He also captured the essence of a stubborn child effecting his will as a young and gentle prince trying to find his footing in a dangerous kingdom. Kim Hye Won’s Byungari was delightful opposite him as the spirit animal who is on one hand a joyful playmate, and on the other a strict guardian attempting to keep her fragile prince from not only destroying a kingdom, but himself as well. G.O and Kim Hye Won were perfect together. 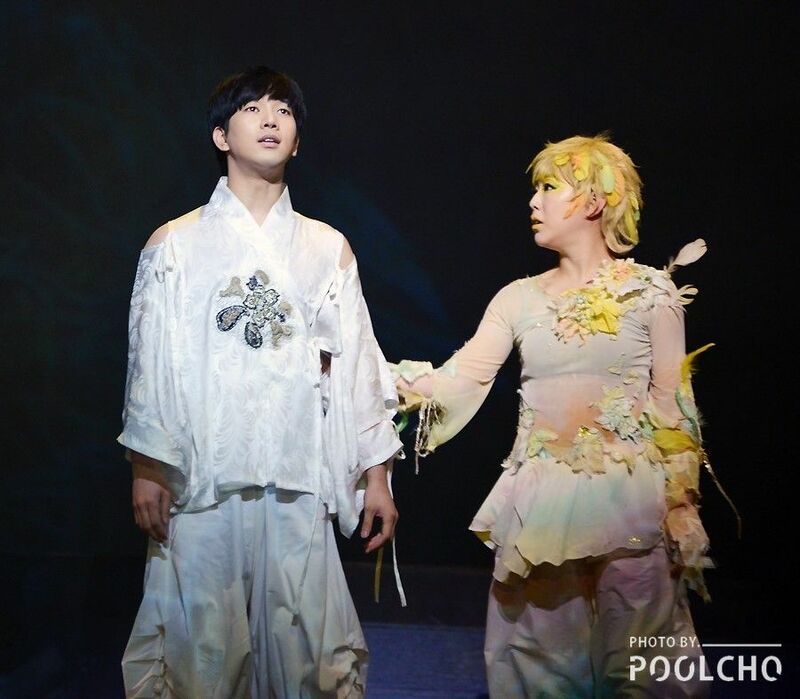 Categories: From The Korean Musical Stage, G.O Military Discharge, MBLAQ Musings, The G.O Files | Tags: 바람의나라, G.O, G.O images, G.O's Military Service, Jung Byung Hee, Jung Byung Hee images, Kim Hye Won, Kim Hye Won images, Korean Musical Theater, MBLAQ G.O, MBLAQ G.O images, Musical Actor G.O, The Kingdom of the Winds, The Kingdom of the Winds Musical | Permalink.